I feel driven to sew myself a swimsuit. Sure it's the end of summer. Sure the weather's changing. But I have the feeling that swimming is again in my future. Because I spent several years playing water polo and I grew up in the swimming pool, I find I am most comfortable when I'm wearing a one piece. Hell, my friend and I used to run around in high school wearing our swimsuits (after swim class and before water polo practice) from one place to another to pick up my oboe and her instrument before the band room was closed locked for the night. Always wearing a one-piece swimsuit and possibly our towels. We were crazy! But there's something really comfortable about a one piece. I was feel like I can count on it to be in place for no muss no fuss. I've owned a basic competition one-piece, royal purple speedo for years. I may have purchased it at Costco or somewhere when I was working in Florida. Either way it's been in my closet for what feels like eons. It was a pretty good fitting swimsuit, but the straps are always a little too long and I felt like I was a little too exposed in the bust line. I was about to go on a trip with some friends and I knew that we are would have an opportunity to hang out in a hot tub or swim. The only piece I had was this swimsuit. So I decided to get a little creative and chop the straps off in the back using my experience with the XYT top from Fehrtrade. I ended up cutting off around 3 inches or so of length from the lower part of the X-straps. When I put it back on the sides drooped. So I took those same cut off bits and it reattach them to the X at a wider angle. The result was fabulous. I had lift, I wasn't so exposed in the front, and the back didn't droop as much. Fast-forward several months. Here I am ready to make my first swimsuit. Like, I have no fear for the first time ever. It feels totally attainable. Like, why wouldn't I sew myself a swimsuit? Jalie 971 is my first foray into Jaile's PDF patterns. So far, I'm quite impressed. The piecing was very easy. They have these neat shapes in the corners which make it super easy to fit it together. Jalie's instructions and tutorials recommend measuring all areas including torso before choosing your size. And the beauty of their patterns is that it's very easy to trace between sizes to create your own custom size. Mind, there are always exceptions and you have to take into account the design, style, fit, ability to put the garment on over the whitest parts of your body, and the stretch of the fabric. In my swimming days the way that a swimsuit was fit was not based on body with measurements or circumferences, but rather by your torso length. As I began to find my size in this pattern, I accounted for everything except my torso length. In fact it seems that I completely forgot my experience remaking my Speedo. Lucky for me though I got the whole piece cut out and then I was able to shorten the suit at the front crotch and also at the straps in the front only. I don't think this would be the way I would recommend fitting it for yourself in the future. Mainly because your body might be shaped differently. However my body is very narrow in the crotch curve and very wide in the hips and around the bum. Often I find that patterns are actually way too wide to the Koch curve. And I'm usually taking out quite a bit of fabric. Fortunately when I began cutting out and sewing the swimsuit, I grabbed my speedo and kept it on a hanger near my work area. Whenever I needed to take a measurement or see how something fit, I grabbed the speedo and measured it. This is such a tremendous way for me to solidify the curve shapes that work on my body versus the pattern shapes. We are all very differently shaped and letting go of any ideas of what should be and just going with what is is very freeing. I'm actually quite fascinated that the speedo is as narrow in width as it is in the crotch curve. Uh oh. Between the way my speedo fits at the bum and through the crotch curve, looks like we've got another Highway 101 or even Utah Mountain highway making extreme u-turns for roadways going on here. I'm really glad I took photos of myself wearing this suit. I can see now, that the bum coverage is a little less than I would prefer. And comparing the finished speedo (adding seam allowances for elastic) to the Jalie 971, I can see how I might take in the crotch curve, but it's gotta be a super quick and very concave curve transition from front to back. After looking this over on the patterns and photos, I think I will keep the Jalie as is (after my 2" shortening of front piece only at the crotch curve) and test the fit. Who knows, maybe I'll discover an even better fit! Goal is to finish Jalie 971 swimsuit this week. So, more soon! PS - the light is low in my photos above, which means it's favorable. Even still, I feel really great about the way I look in my speedo. Yes, I've lost 15 lbs through my increase in exercise (dance & sweating) this summer. But, a year ago, 2 years, 3 years, even 8 years ago, I don't know if I could have looked at photos of myself in a swimsuit, looking nearly the same and thought, "Damn, I look good." Usually it isn't until years after a photo taken that I think, "Oh I looked so good then, why couldn't I see it? Why wasn't I nicer to myself? Why couldn't I just love myself as I was? I was wonderful!" Well, I want to be the change, and I'm shifting my self talk every time I catch myself, and I do believe, Watson, that it's working. By Jove, I think I'm getting it! 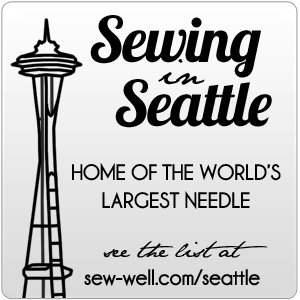 What's your sewing goal this week or month? Better yet, tell me how you are loving and honoring yourself this week? Maybe you can teach me a thing or 2!